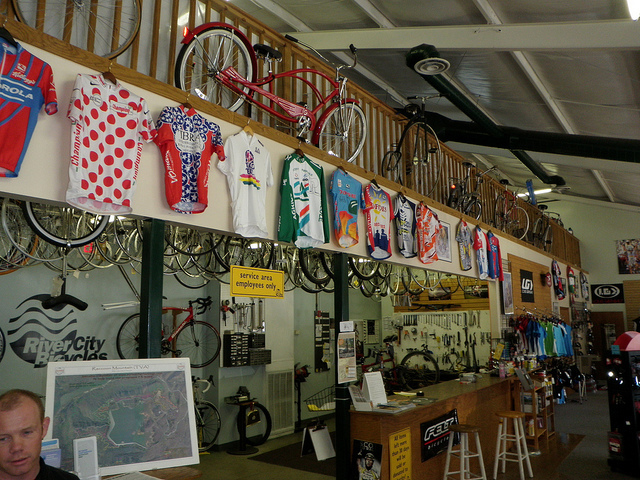 While my trip to Tennessee has ended, the memories of my bike shop tour work trip live on in my memories and on this blog. 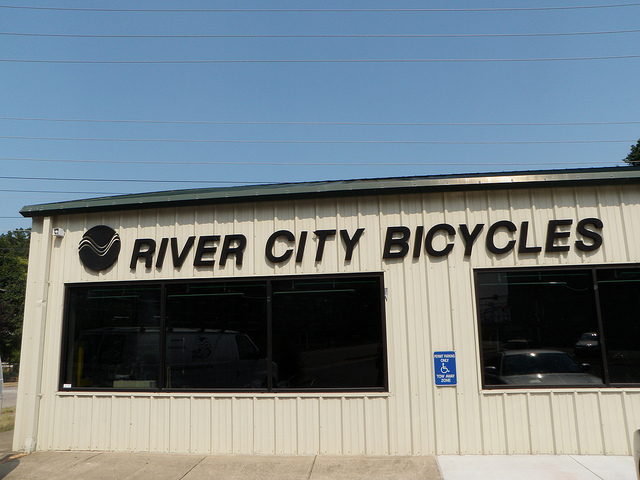 River City Bicycles in Chattanooga, Tennessee, was my third bike shop destination. This is an inviting shop with a large retail space. I must confess that I did not survey the inventory as much as I should have because I was quite taken by the shop’s cat, Lily. I liked the bikes on display, too. It’s always fun to see a high wheeler. Inside the Shop. High wheeler in the Background. 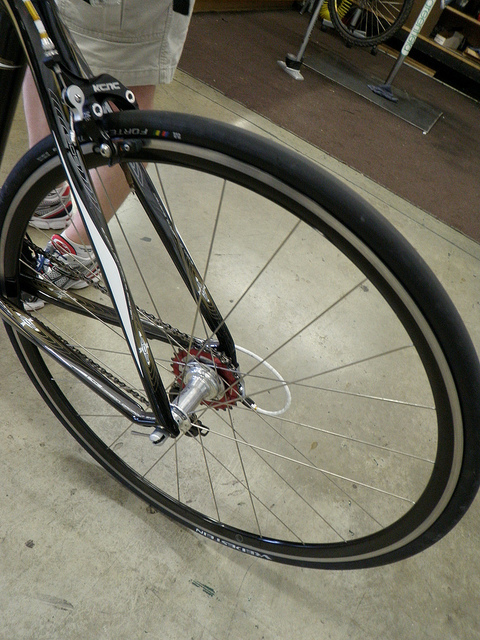 The owner of the shop, Ronald, was super-friendly and we spent some time talking and admiring his road bike. Ronald freely admitted his roadiness, saying that he likes being able to get in shorter rides and still have time to get home and do errands and other things. Hey, is he saying that touring cyclists are trying to avoid their responsibilities? Just kidding! I’m not much of a roadie, but his bike was alright. And very clean! It’s shameful how little I know and appreciate carbon bikes; I didn’t even take a picture of his Scott. Sorry! 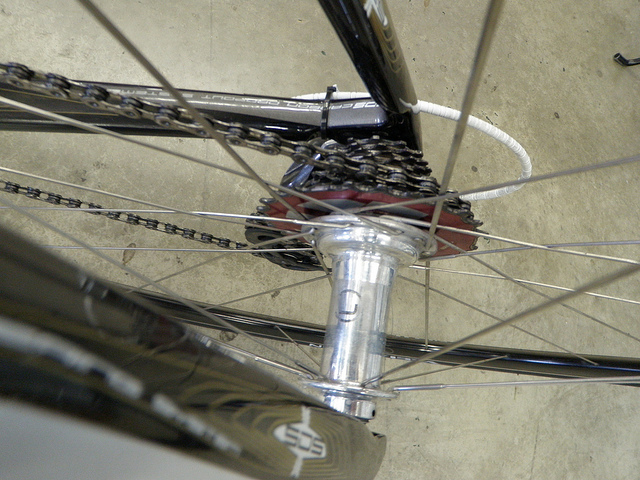 I did, however, get a couple of photos of the bike’s Ligero wheels, which had a nice look to them. Troy Watson, a wheel-builder who lives and works in Chattanooga, is the man behind Ligero. See how pretty they are? Ronald was also keyed into the local scene. He showed us the work of a local artisan who is using recycled inner tubes to make bracelets, and he recommended a local coffee shop, Velo Coffee Roasters, with whom they trade wrenching for coffee. He also told us about one of the popular local spring century rides, the 3-State 3-Mountain Century. This ride goes over three mountains and passes through three states (just like riding in D.C. if you count the District as a state AND except for the mountains part). If you are ever in Chattanooga and want to talk bikes or find out where to ride, I think Ronald would be a good contact. 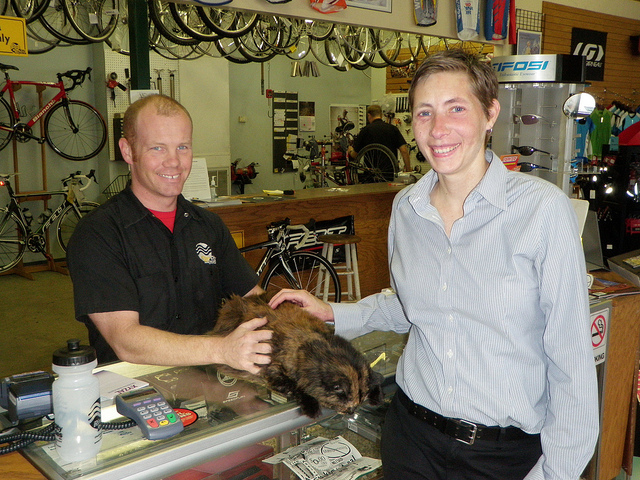 Also, if you want to see a fine-looking shop with a friendly and furry bike shop cat, River City Bicycles is the place. I took a few additional photos of our visit, and you can find them here. One Tennessee shop left to blog, and it’s in Knoxville. Phew! I have the worst time spelling Chatanooga Chattanooga correctly.